A team of artists from the Nashville area, including two Mercy graduates, presented a Creative Arts Camp to the Nashville Mercy residents last week. 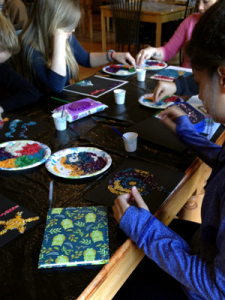 Sarah Dixon and Krystal Cook, both 2006 Mercy graduates, teamed with local music artist Jessica Blevins and visual artist Samantha Allen to facilitate a two-day camp that introduced healthy ways to communicate through different art modalities. The camp’s theme was “Beauty for Ashes,” taken from Isaiah 61. Each day the residents received a brief art teaching and heard personal stories of how God can create beauty from the “ashes” of our lives. 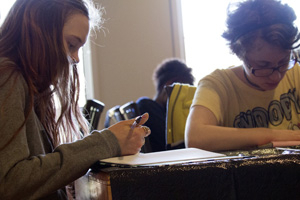 Residents participated in such activities as creating artwork with actual ashes and “painting pictures with words” through journaling and songwriting exercises. 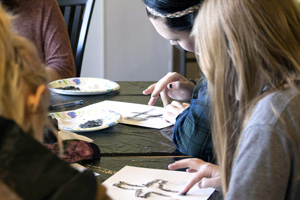 “The arts camps and using art in discipleship and mentoring came from my own background and the powerful effect art had in giving me a voice and encountering the presence of the Lord in a way that connected with my heart,” said Dixon. Before entering the Mercy program themselves, Dixon and Cook both struggled with eating disorders and self-harm. 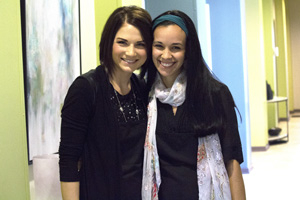 At Mercy, they each experienced God’s transforming power and are now, a decade later, multiplying hope and healing to others. 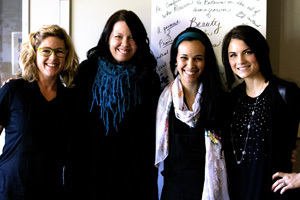 In the past year, Dixon has founded Arise International, an organization that works to place creative arts teams with other international organizations who distinctly work with women and children impacted by trauma. “What we do is to facilitate contexts for God to speak, heal, and minister through the use of the creative arts,” said Dixon. To date, Arise arts camps have been held in the U.S., Bangkok, Pattaya, and Kathmandu, where Dixon was doing mission work for the past year and a half. Future camps are planned for other parts of Southeast Asia, Europe, and the Middle East. However, before heading overseas again, Dixon wanted to take this stateside opportunity to assemble a creative team and give back to Mercy. The responses below show the deep impact the camp had on the Mercy residents.